I started reminiscing about this little adventure after reading Jean Mackay’s blog post about her trip to see the puffins on the coast of Maine, U.S.A.. You have to check out her sketches. They are amazing! Below is a snippet from one of her posts. Skomer Island is well known for its population of puffins, and is home to the largest Manx Shearwater colony in the world. It is a great day out with plenty of wildlife to watch and beautiful scenery to view. 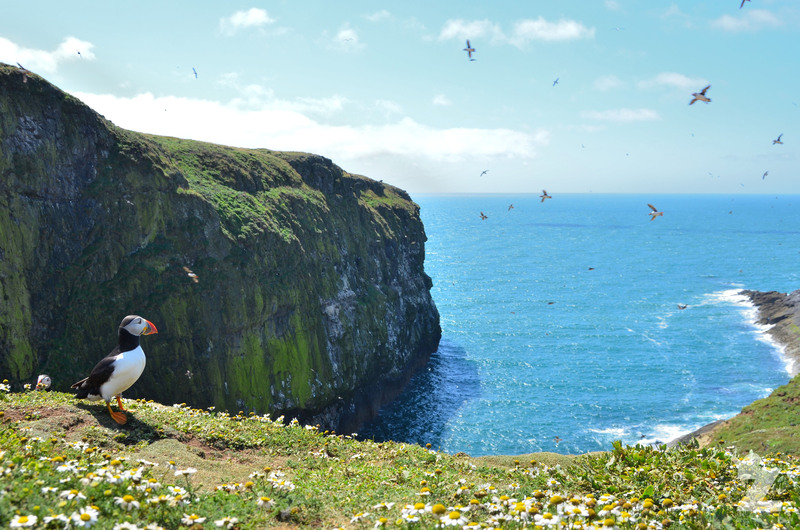 Could you pick a more idyllic setting for a puffin photo-shoot? 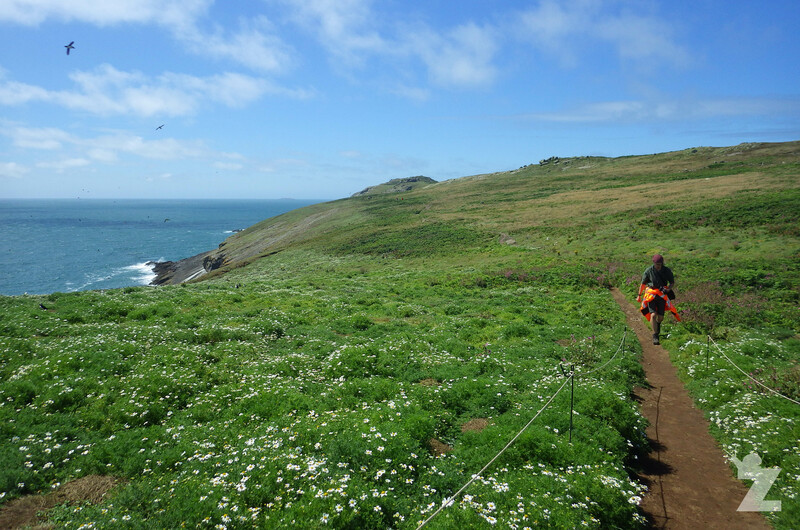 I wanted to write this blog post to let you know how you, too, can get a chance to experience the wonders of Skomer Island. Pack your picnic, buckle up tight, and let’s get going! Clothes for both hot and cool weather – As you will see from our photos, the day started off cold with terrible visibility, but by the end of the day it was a scorcher! A picnic and snacks – There is no food available to buy on the island. You can buy water if you need. Binoculars and a camera! You can even hire binoculars on the island. Skomer Island is located 10 minutes by boat off the coast of Pembrokeshire, West Wales. The island is open from 1 April (or Good Friday, whichever is earlier) to 30 September and is closed Mondays except bank holidays. To catch the boat to the island, drive to Martins Haven, a small cove two miles on from Marloes village, which is 12 miles southwest of the county town of Haverfordwest. 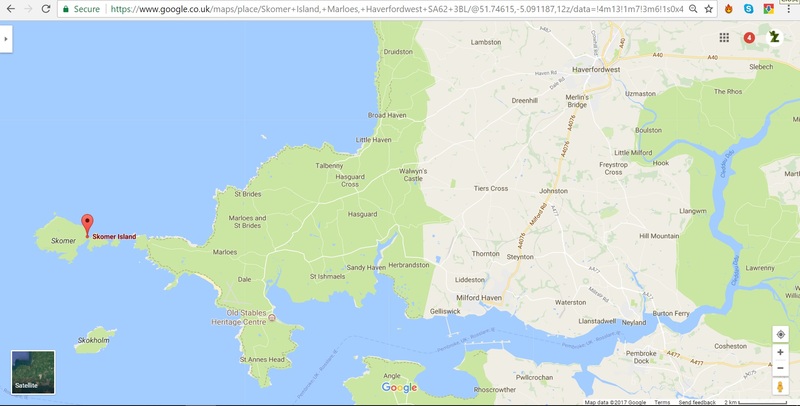 Once you arrive in Martins Haven, park in the National Trust carpark (same postcode as above). This costs £5 per day. Take a short walk from the carpark down to Lockley Lodge – the Wildlife Trust’s sale and information centre. You can buy your Landing Fee here. You will be given landing tickets which are colour coded to tie in with the departure time of a specific boat. 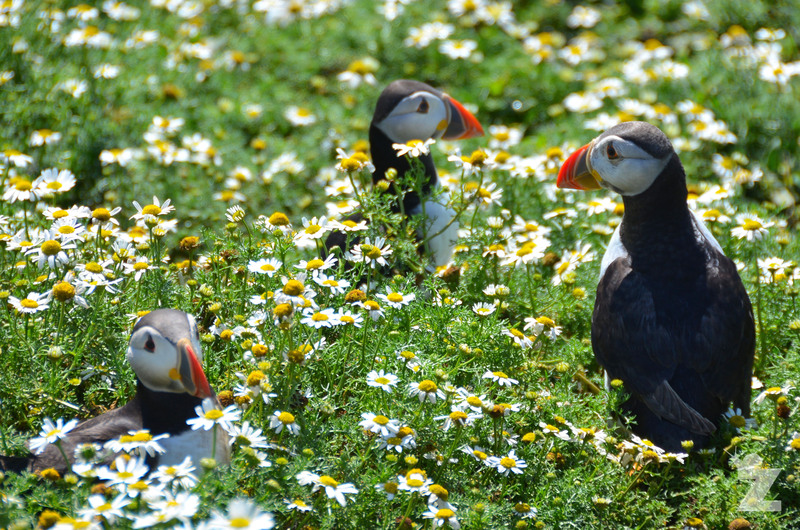 Top Tip – If you become a member of the Wildlife Trust of South and West Wales, not only will you be supporting their work on the island (and elsewhere), you will get free landings on Skomer! Click here to read about becoming a member. Walk down to the cove to board your boat. You pay for your boat fare on the boat. Take cash with you as you can’t pay by card. Weather permitting, boats depart at 10am, 11am and 12 noon (additional crossing may be available during peak periods). Return trips run from 3pm and are allocated according to your outward journey. 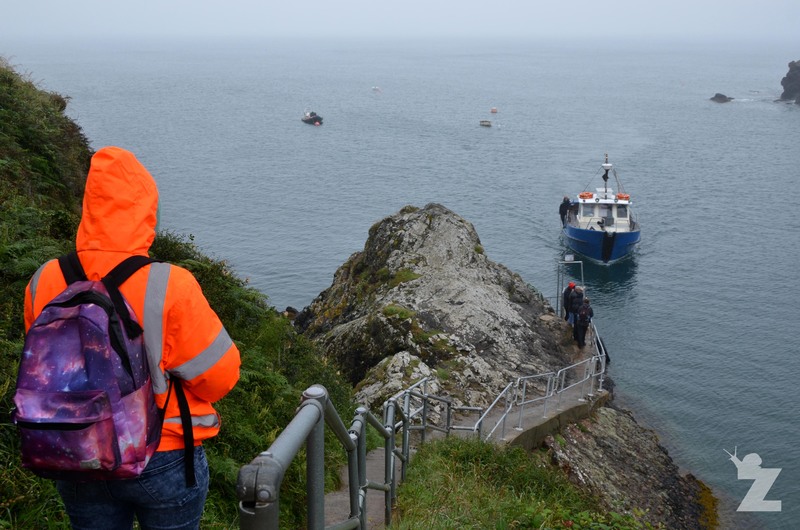 There are daily updates regarding the boat schedule on Twitter at @skomer_boatinfo. 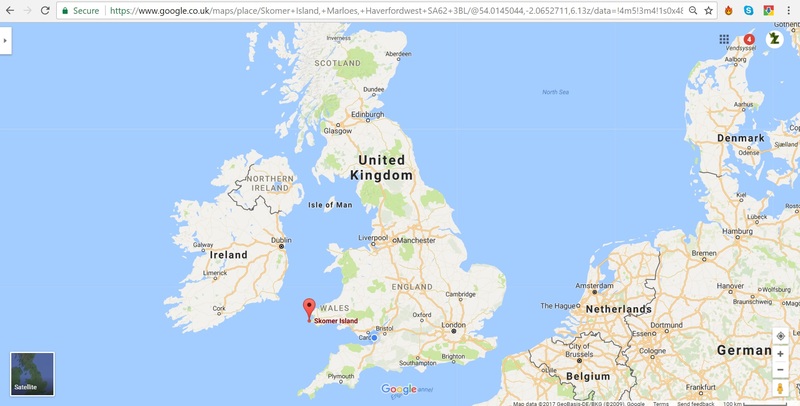 Skomer Island Prices from https://www.welshwildlife.org/skomer-day-trip/ (Retrieved 6 July 2017). Please visit their website to confirm prices. Only 250 people are allowed to visit the island per day, and boats cannot be booked in advance, so arrive early. When we visited last year on a weekday with bad weather, we didn’t even make it on to the first boat as it was full. This Wednesday (beautiful, sunny weather), we thought we’d visit again. We arrived at 9am and all the boats were booked until 12pm. Apparently people had started queuing at 6am! The flora and fauna you see will depend on the time of year you visit. Tom and I visited at the end of July. Below are a few species we saw during our walk around the island. Check out the last two ocean images carefully… We didn’t have a long-lens last year. Hopefully next time we visit, we can get some better shots! A gannet and a porpoise! Click here for the ‘Skomer Island Wildlife Report’ (PDF document) for 2016. The report contains systematic lists for sea and land birds, moths, butterflies, cetaceans, reptiles and amphibians. I do love a checklist! We’re going to write a separate blog post on the puffins as they were definitely the main attraction for us. But, for now, here are a few shots we captured. [EDIT: The puffin post is now live! Click here to view.] It really wasn’t all that hard either as there were thousands of them. In fact, reading the ‘Puffin Fact Sheet’ published by the Wildlife Trust of South and West Wales (PDF here), they estimate there to be around 6000 breeding pairs on Skomer! “Wow! A puffin!” I’d never even seen one before, let alone been so close to one. There is a loop-track and various other intersecting tracks around the island. From when you get off the boat to when you have to board to go back to the mainland, you have about four hours to spend on the island. With all of our stopping to take photos, we had to run back to catch the boat in time! Tom reading the map to see which way to head first. So many choices, so little time! If you are also interested in the history the island, there are a number of sites you can can visit on your walks. These range from the remains of an Iron Age round house to the Old Farm Complex that was built in the 1840’s. 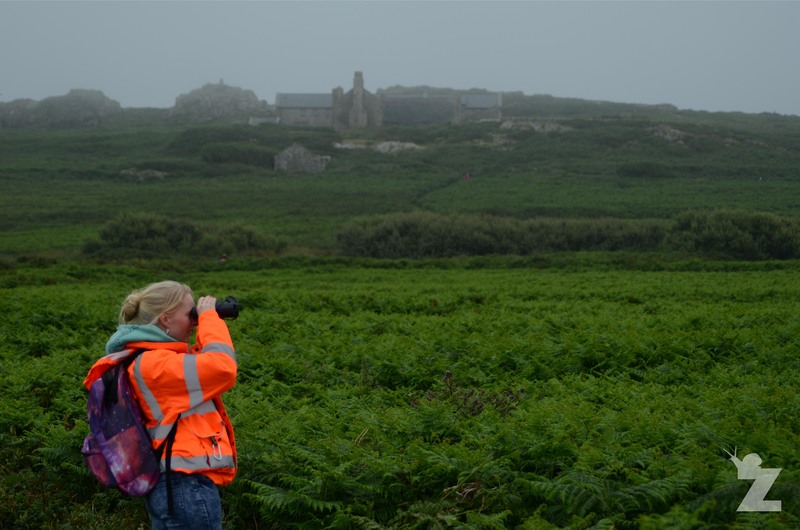 You can read more about the history of Skomer Island in a fact sheet published by the Wildlife Trust of South and West Wales (PDF here). We had a wonderful day, and we highly recommend checking out Skomer Island for yourself. 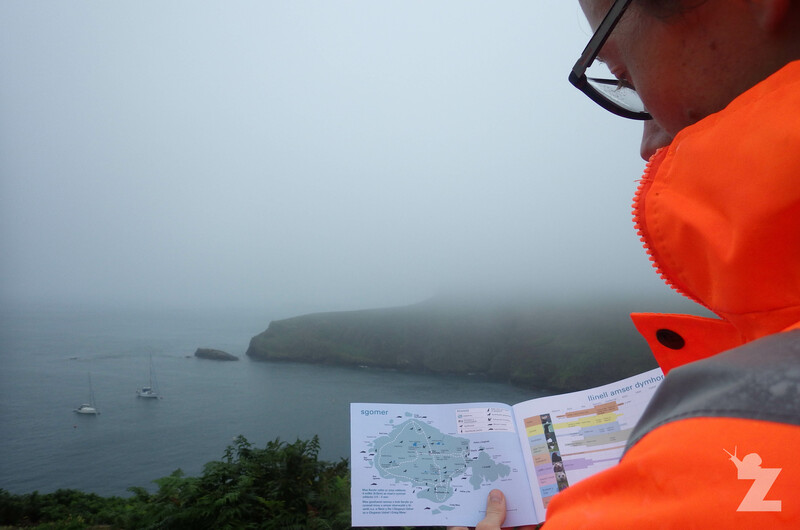 If you have any questions about our trip of Skomer Island and its residents, please don’t hesitate to ask! Wow! This is awesome, and must have been awesome! What a fabulous blog with some wonderful images! Thank you for sharing 🙂 I will look forward to your blog about the Puffins! Thanks so much, Pete! It really was a wonderful day. 😀 I never thought I’d ever get to see a puffin, let alone so many! Beautiful, wee birds. Thanks for the shoutout and the detailed post about your trip. 6000 pairs must be quite the sight! We were there at the tail-end of the puffin season, so there weren’t as many as 6000 pairs, but there were certainly thousands of them! Definitely an amazing sight. Wow! Diving around the island must have been awesome! It really is a great place. We definitely hope to head back at some point next year. I assume you went diving with uni? Is there is a way for the public to dive? What do you reckon the best time of year to dive is? I went on a trip that runs with my uni club, keeping it cheap and cheerful with camping and club boats! There are dive shops and charters you can hook up with in the area though. The currents around Skomer can be pretty extreme so if you’re not confident planning dives around slack times etc that’s probably the best thing to do. It’s also worth talking to the marine reserve staff who do diving surveys in the area – they’re always helpful and really interesting!